From the Ashes, Rise Adventure! Believed to be savage and dimwitted by most of the denizens of the world, the lizardfolk are an old and long lived race. Unlike most of the beastfolk who are more or less relegated to the plains of Tabaria, lizardfolk have long since spread to anywhere in the world, partly do to being favored servants of dragons during the age of wyrms, long before the first elven city rose to the stars. However, they too rebelled against their draconic overlords with the other races when the hubris and corruption of the once great wyrms grew too great. Today they have changed little, while the world has been built up and torn down around them over countless wars and disasters, and yet the scaled folk remain, venerating both nature and dragons in equal measure, and so too will they remain when the future becomes the past. Lizardfolk found throughout the world are usually mercenaries, or individuals who are on some sort of personal quest such as to advance their spiritual wisdom, learn more of the world, or perhaps even choose a mate from another tribe elsewhere. Lizardfolk who can unearth secrets of ancient wisdom of their lost era of prosperity (which dates back even before the demon wars) are well respected in their tribes. Some particularly brave lizardfolk venture out in search of their old masters the dragons, where they seek their wisdom, blessings, or to attempt to slay them (as many tribes believe that the dragons became corrupted which was ultimately what led to the degeneration of society during the age of wyrms and venerate draconic ideals rather than dragons themselves). Lizardfolk look very similar to one-another but their various tribes and subspecies tend to have different color patterns based on their locations and regions. Despite their appearance, lizardfolk are not cold blooded and some even reside in cold climates where they once served white and silver wyrms, but most of them dislike such places where one cannot swim for long without suffering hypothermia, and most of their tribes prefer little in the way of clothes. Still, some travelers near cold forests and lakes of the north have mentioned stories of vicious and brutal reptile men clad in the flesh of great beasts such as polar bears and worgs. Size and Type: Lizardfolk are medium humanoids with the [Reptilian] subtype. Speed: Lizardfolk have a 30 ft. base speed and a 30 ft. swim speed. Low-light Vision: Lizardfolk have low-light vision. Ancient Flesh: Lizardfolk have a +5 natural armor bonus. Serpent Poise: Lizardfolk have tails that grant then a +4 racial bonus to CMD against Bull Rush and Trip combat maneuvers. 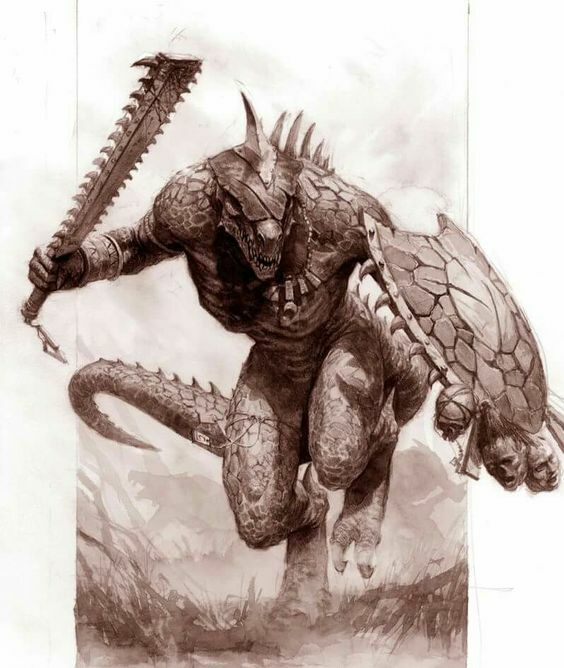 Serrated Teeth: Lizardfolk have a primary bite attack that deals 1d3 bite damage plus their Strength modifier. Reptile Claws: Lizardfolk have a pair of primary claw attacks that deal 1d3 claw damage plus their Strength modifier. Tail Lasher: Lizardfolk have a long tail scaled tail that grants them a secondary tail attack that deals 1d3 damage plus their Strength modifier. Lizardfolk can attack with their tail at twice their normal reach. Strong Metabolism: Lizardfolk have a +2 racial bonus against disease, ingested poison, and becoming sickened or nauseated. Riverborn: Lizardfolk have a +8 racial bonus on Swim checks and may always take 10 on such checks. Lizardfolk can hold their breath for a number of rounds equal to four times their Constitution scores before needing to breath. Languages: Lizardfolk begin play speaking Common and Draconic. Lizardfolk with high Intelligence scores can choose from the following: Aquan, Giant, Goblin, Halfling, Orc, and Sylvan. See the Linguistics skill page for more information about these languages.